I was grinning like the proverbial cat that ate the canary as the horses entered the starting gate for the 2011 Kentucky Derby. For, throughout the week, I had heard that the pace in this year’s Run for the Roses was going to be brutal. All the trainers and jockeys were saying it, the blogosphere was buzzing about it… heck, I think even the Mayans made some veiled references to this year’s expected pace meltdown in Louisville. But I knew better. Feeling somewhat mystical and “seer-ish” myself, I defended my opinion that the pedigree-challenged Comma To The Top was a prime Derby contender like Master Po (from the old “Kung Fu” TV series) and/or Mister Miyagi (“Karate Kid”). “At times, the seemingly impossible is possible precisely because everyone thinks it is impossible,” I told a Facebook friend from my incense-filled study, where I was busy analyzing my TwinSpires account history for the previous day’s races (otherwise known as the “Dead C-Note Scrolls”). Naturally, my buddy thought I was nuts, but my confidence grew and grew with each nervous proclamation about the expected sizzling splits. By the time the gates sprung open and Comma To The Top promptly rocketed his way to the front of the pack, my smile had become so expansive that I resembled a divorce attorney at Larry King’s wedding (pick one), as I anticipated what would shortly unfold. Patrick Valenzuela, one of the great frontrunning riders, was going to slow the pace and, in effect, shorten the Derby distance from 10 to 8 ½ furlongs, which another of my cynical Facebook friends had suggested was the limit of Comma’s stamina. Gleefully, my mind moved on to other things — like how I would spend my Derby booty. But Comma To The Top failed to hold his position. Possibly due to an ankle injury he was said to have sustained during the running of the race, the gelding instead conceded the lead to Shackleford, a horse I hated, in part because I thought he was going to have to come off the pace. I cursed “P-Val” for his apparent idiocy as I watched Shackleford record a -1 early speed ration (ESR) — not just slow, but Kendra Wilkinson slow — and I knew that I was on my way to winning the battle, but losing the war. As it turned out, I lost the war too. Although Shackleford confirmed that he was worthy of my condemnation by being the first horse since Sea Cadet (in 1991) to finish out of the money after leading at the stretch call in the Derby, none of my preferred frontrunning contenders fared any better. I’m sure General Larry Platt would agree that my top choice, Pants On Fire, had me “lookin’ like a fool” when he checked in ninth — yet that was the best finish (outside of the aforementioned Shackleford) from any horse among the top-5 at the first call. The implications of this are truly stunning. Since 1932, the Kentucky Derby champion has led from flag fall to finish 14 times in 80 runnings (17.5 percent); in Derbies featuring an ESR of -7 or greater, that ratio jumps to nearly one in four (five wire-to-wire winners, 22 races). 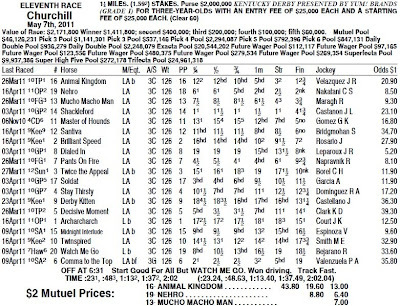 Of course, all of this bodes well for Animal Kingdom, who one might say “bucked the bias” in Louisville on Saturday. 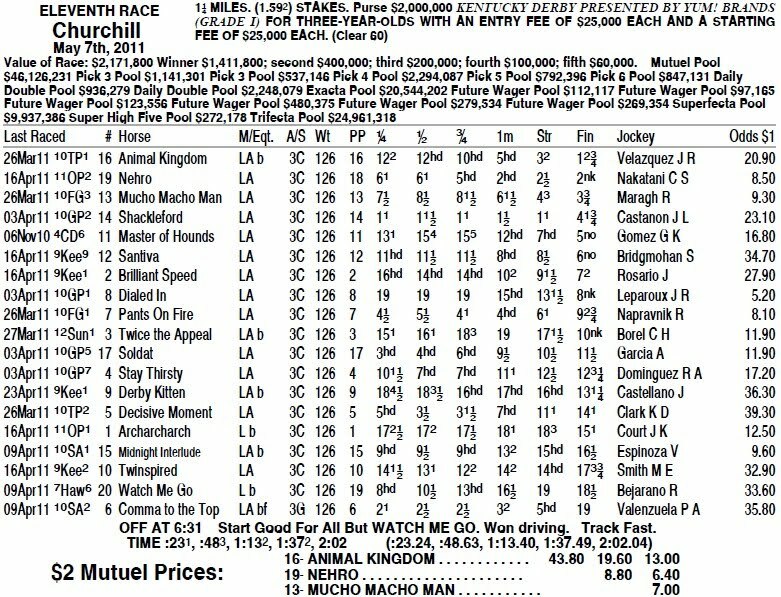 Of the 13 Derby champs that went on to compete in the Preakness Stakes after not leading at the first call of a moderately-paced Run for the Roses (-7 ESR or greater), seven won. Of those running worse than third at the first call in Kentucky, six (of eight) were able to duplicate their success in Maryland. Due to my successful pursuit of the Rainbow-6 and my unsuccessful quest for Derby glory (I did cash the Oaks-Derby Double, but blanked on my other bets), I have temporarily suspended my “pro” betting activities (see “Becoming a Pro Gambler, Part Deux”). Needless to say, I have grown my starting bankroll of $492.60 considerably (a pick six — even one for a dime — will do that), but placing multi-race wagers and betting crapshoot events like the Kentucky Derby are not what I consider to be professional bets — under most circumstances. So, knowing that I will continue to make such wagers in the future, I’ve decided to split my betting accounts into a “pro” pool and a “for-the-fun-of-it” pool. As soon as I can work out all the details, I will once again be publicly tracking all my wagering successes and failures. I am so happy to read this blog post. Thanks for sharing this here. I just want to say what a great blog you got here! I have been around for quite a lot of time, but finally decided to show my appreciation of your work! You are really doing well for your readers. Each and every post you shared here is worth reading. This blog is definitely entertaining and factual. I have picked up a bunch of interesting advices out of this blog. I would love to come back again and again. Thanks a bunch!